The variety of software programs for story development employ different structural paradigms. Each of those programs (with the exception of Dramatica) relies on a variation of the hero’s journey. Truby does it directly, tailored to specific genres, Collaborator relies on Aristotle’s version as laid out in “Poetics.” Power Structure doesn’t rely on one concept or perspective, but still lines things out in “steps” that you can tailor to any “journey-type” approach. New Novelist follows suit. Essentially, you work on each step independently, referring to what you created in other steps, then string them all together to see what needs to be done when. You end up with a linear list of instructions for writing your story, containing all the specific information you developed along the way. Dramatica differs insofar as it is NOT based on the Hero’s Journey concept. In fact, when I started Dramatica, I’d never heard of the Hero’s Journey – I was just interested in what made stories tick and set out to discover it for myself. Everyone assumed that’s the direction we were taking – until they actually saw the work. But, the biggest problem people have trying to understand and figure out how to use Dramatica is that they can’t let go of the Hero’s Journey and try to stuff Dramatica into that mold in their mental image of it. Problem is, Dramatica doesn’t fit that mold very well, so they see it as flawed, rather than as an alternative paradigm of story structure. And what’s worse, StoryWeaver was designed as both a departure and complement to Dramatica, so it is, essentially, the inverse counterpart of something that is NOT the hero’s journey. Try explaining that! Okay, here goes… Dramatica in one paragraph… Rather than seeing a linear journey, Dramatica sees a story as a ball of twine, or perhaps more like the scanning lines on a TV screen. Linearly, everything needs to make sense like the hero’s journey – and that defines the audience experience of the story as it unfolds. But in addition, each scanning line ultimately creates the Big Picture – the real meaning of the story. And, of course, both the linear progression and the overall Big Picture meaning are complete connected and dependent upon one another. We feel that the Hero’s Journey only covers the linear, leaving it to the author to try and make the Greater Meaning make sense. What we discovered in Dramatica were the underlying components of story structure that appeared in both the linear and Overview perspectives of story. We spent years documenting them, discovering their almost mathematical relationships, and then building an engine that could calculate the effect on the Overview when the steps in the journey are changed, and vice versa. That is the Story Engine at the heart of Dramatica, and everything else is basically interface, education, and reports. In fact, one of these reports looks only at the linear progression for convenient reference, and that is the report that looks a lot like New Novelist, Blockbuster, Collaborator, and Power Structure. While Dramatica deals with the underlying structure of a story, StoryWeaver deals with the subject matter. Nobody sits down to write a great structure. We write (and audiences and readers come to our work) because of passion – the author to express his or hers, the audience/reader to ignite its own. What makes us passionate is not the structure, but the subject matter – be it a historical romance, a sci-fi epic, or a true-to-life experience. StoryWeaver looks at the big picture just like Dramatica, but not at the structure. Rather, StoryWeaver helps you build the big-picture of your subject matter. There are four stages in StoryWeaver. The first is inspiration that helps you describe all the bits and pieces of subject matter you already have, then use them to inspire more material until you have a well-rounded over-all concept for your story, all the characters you need, the key events of the plot, and so on. Unlike Dramatica and even the Hero’s Journey-type programs, In StoryWeaver you don’t create characters by their dramatic function (such as antagonist, trickster, or dragon.) In StoryWeaver you build the character’s personality – without yet even knowing whether it is a main character, protagonist, antagonist or whatever. StoryWeaver deals first with the person – what’s he or she like, what do they like to do, what kind of attitude do they have, and so on. 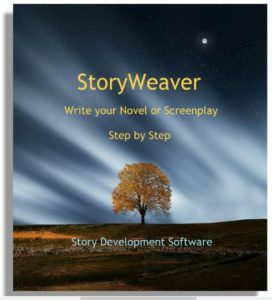 Plot-wise, StoryWeaver is not concerned with steps in a journey or even with Dramatica’s inter-related structure of Goals, Requirements, and Sign Posts. Rather, StoryWeaver is focused on what the plot is ABOUT. What is it that really excites you about the plot; what would you like to see happen? What interesting concepts can you come up with to fill in areas where you plot isn’t yet complete? And StoryWeaver helps you do all this. The final big difference between StoryWeaver and ANY of the other programs, Dramatica included, (and also what I think is truly revolutionary about StoryWeaver) is that you constantly build on the work you’ve already done for the story as a whole, rather than working on each piece or step independently and then assembling them together. The New Novelist report you sent shows Step 1, and then describes what ought to happen there and shows what you wrote to accommodate this step. Then, the report moves on to Step 2 and so on. In this way, it seeks to be a blueprint for your story. But in StoryWeaver, it takes the global perspective of Dramatica, shifts the focus to subject matter and works on the overall Big Picture through a series of “Developmental” steps. So, each step is not a plot point in the story, but a creative step in the Author’s Journey of getting the story told. You see, before StoryWeaver, I realized that all the other programs out there were concerned with having the author work out the order of events and their meanings in his or her story. But there really wasn’t anything that helped the author know what to do next in his or her own creative process! The departure, then, is that StoryWeaver presents a series of 175 questions that move the AUTHOR one step closer to a completed story. Each step deals with the WHOLE store. You work out a few details, work them into a brief synopsis, then add more details and re-write the synopsis. 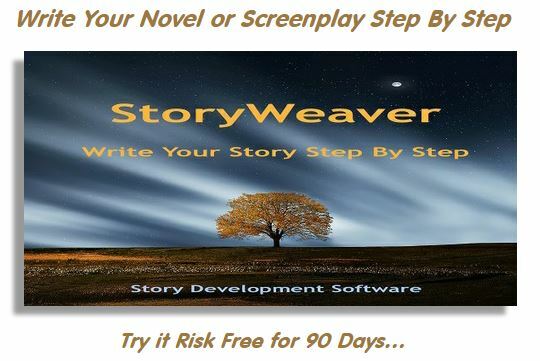 The StoryWeaver path is a series of re-writes, developing a bit more of your story and then blending it into the already written work, making it stronger, richer, better. So, when you arrive at the end of StoryWeaver, you don’t get a blueprint for a story that you then need to write – in fact, you’ve already written it. You end up with a detailed treatment for your story that reads like the finished story without all the word-play. It doesn’t tell you what to do, it has already done it. It is a story that is told as it unfolds, filled with all the details you have developed, unfurling paragraph by paragraph, all in your own words, from beginning to end. This final treatment is a descriptive narrative that relates the story in a conversational way. Everything is there, but not yet ratcheted up for style. So by the time you finish StoryWeaver’s path, the only thing left to do is re-word your treatment to make the words sing, limited only by your ability as a storyteller. Therefore, the reports in StoryWeaver are quite different than in any other program. You do get information on every question you answered, but you also get something none of the others have – a complete story, already told in your own word in a perfunctory manner, ready to be embellished with your style. Well, I hope I’ve adequately explained the “vision” I’ve had for StoryWeaver, and what I believe makes it more creative and more author-friendly than anything previously available. And, of course, I decided to sell it at $29.95 because, quite frankly, I think most writing software is overpriced by a factor of 5, and writers generally have a lot of passion, not a lot of money. In future versions we’ll be adding all kinds of creative aids, like time-lines and index cards, as well as a variety of reports should the author want to examine any aspect of his or her story in detail. But all that is just support material for the prime function, which is to keep the author excited about the story by focusing on the subject matter, rather than the structure, and to be a step-by-step guide through the entire creative process of developing and telling a story, rather than focusing on the steps in a Hero’s Journey. This entry was posted in Dramatica Software, Story Development, StoryWeaver Software. Bookmark the permalink.